The energies to buy land for the Bata people who are known to be the initial inhabitants of the forests which were gazetted as national parks including Mgahinga and Bwindi popularly known for gorilla trekking safaris in Uganda have started to gather momentum with shillings 30 million noted to be on the account. The Special fund which was set up by the Uganda Wildlife Authority the body that is responsible for managing the Uganda’s wildlife which attracts travellers to plan safaris to Uganda including Uganda gorilla safaris in conjunction with other partners worked to help the community of the Batwa who until 1992 occupied Bwindi, Mgahinga and other jungle areas located with the massif of Virunga. The Batwa are known to have depended on forest products for survival. Following the establishment of Mgahinga Gorilla and Bwindi Impenetrable as National Parks, the Batwa community was removed from the parks and thus became squatters in foreign land. This forced them to live in poor conditions with challenges to adaptation of the new living condition. The argument that the Batwa’s customary rights over the land were not recognized when they were evicted with limited or no compensation contributes to their landless state of the present. 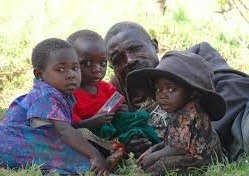 At the moment, about 6,700 Batwa people are known to be living in Uganda with most of them in the south west. In a bid to support the Batwa in the new life that they were introduced to, the Uganda Wildlife Authority came up with a package named Batwa Trail that enable the Batwa to take the people on Uganda safaris and tours on their historical journey in these ancient forests. In Mgahinga Gorilla National Park, the Batwa trail closes at the remarkable Garama Cave the palace for the Batwa King. According to the Tourism Warden Mgahinga Gorilla National Park Mr. Turinawe Moses, from 2011, the activity has gathered around 30 million Shillings on the Batwa account gathered from the travelers that undertaken safaris in Uganda . The foreigner pays $80 while the citizen of the East African community pays 50,000/=. This money is shared by Uganda Wildlife Authority and the Batwa People. Once the money increases, the Batwa Resettlement Committee will buy land for resettling the Batwa.